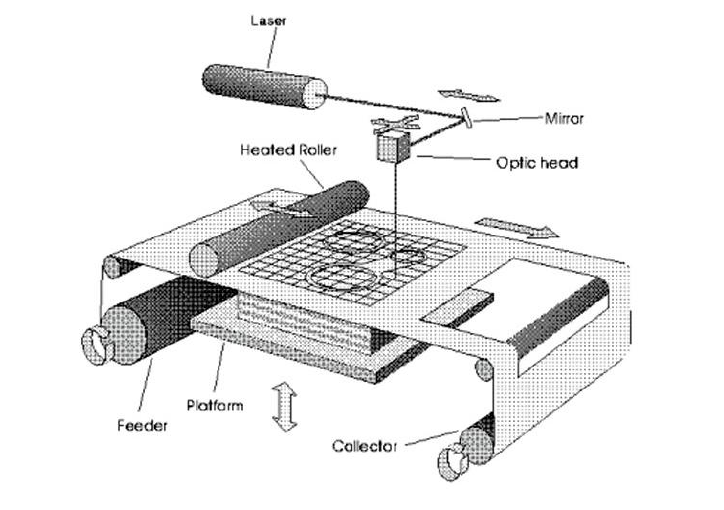 Laminated Object Manufacturing (LOM) is a 3D printing technology patented by Helisys Inc., now Cubic Technologies. Layers of paper, plastic, or metal laminates are coated in adhesive, glued together, and then a knife or laser cuts the part. LOM materials cost less than other materials typically used for 3D printing, such as ABS or PLA plastic and can print parts quickly. First, the user creates a 3D model using a 3D modeling program and saves it as an STL file. The file is sent to the 3D printer’s interfacing software, which slices the model into sections and determines how the layers will be printed. The user places tape on the print bed so that the print material will stick. A sheet of paper, plastic, or metal laminate coated with polyethylene is rolled onto the print bed with a heated roller. The heated roller melts the polyethylene coating and causes it to stick. A laser traces the shape of the model. The laser cross-hatches the material not used for the part to act as support material. The platform moves downward and another sheet of material is rolled on top of the previous layer. The process is repeated until the part is complete. The part is then removed by shaking or chiseling away the support material. Lastly, the part is sanded and lacquered.